You can fit a week of your life in hand luggage. You have learned not to ask questions about what is on your dinner plate. You occasionally wake up and have to think about what continent you are on. The clerk at customs knows your first name. You know the names and locations of hardware stores in several countries. An exhibition hall is the only place in the country where you feel at home. You like fried food as long as it’s dead. You have a pre-packed suitcase at home. You realize each venue has its own unique smell. You’ve learned to accept that there’s not one type of toilet. You know how to order “BEER” in multiple languages. You don’t have to look up visa requirements when you’re traveling. You have multiple currencies in a box somewhere at home. You’re cool with labor work situations in different regions. You keep a world time zone map on your desktop. You have a list of the national and religious holidays in many different countries. You can easily switch your exhibit terminology from booth to stand to stall according to the country where you are working. You are a respected critic on many foreign dramas, movies, and TV shows. You can convert feet to meters and back at the drop of a hat. You don’t think it’s unusual to work 16-hour days. 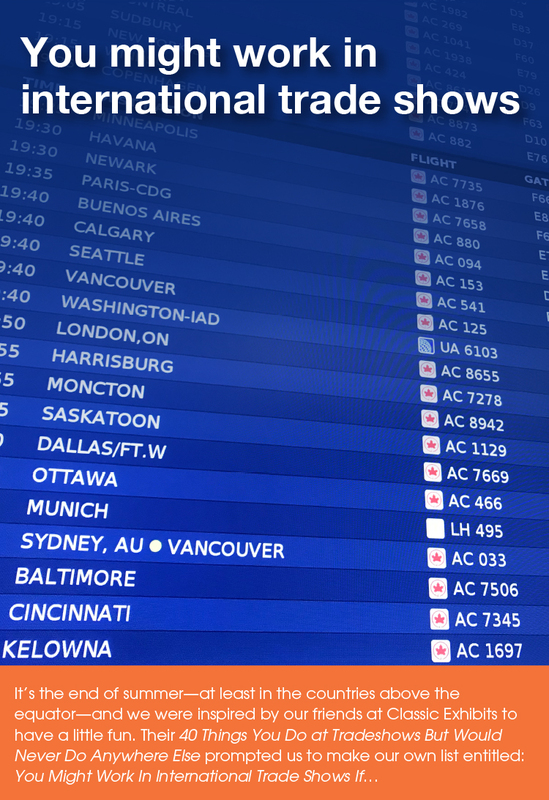 You can confidently agree and or disagree with top 10 best airport lists. You know airlines by the snacks they serve. You’re the least eager to board the plane. You know how much time you REALLY need to get checked in at the airport. You wait until they start calling your name to board that 13-hour flight. You are equally comfortable driving on the left or right side of the road. Bamboo ladders don’t surprise you anymore. Barefoot workers don’t surprise you anymore. You know which country a person is from by their accent. You know exactly when your passport expires. You know that a “taxi” does not always have four wheels…or doors. You can guess the country where the booth was built by looking at the back wall. You still get really excited when a project comes up in a country where you have never worked before. Putting your show schedule together? Planning work in the APAC region? We’re here to help. Visit our exhibit portfolio to see the scope and quality work we have done for so many of our clients. PS: Hat tip to Classic Exhibits!